This lady required several changes to her nose. To address her concerns this lady underwent an open structure rhinoplasty, nasal septal reconstruction and powered turbinate reductions. After rhinoplasty the nose is straighter and the bump is removed. The tip is more refined. Overall the nose has a natural appearance in keeping with the facial features. The nasal airway is improved and breathing is easier. Rhinoplasty is one of the most frequently performed cosmetic surgery procedures. If you have ever considered having nose surgery, you probably want to find out what it will cost. This article provides general advice only and is not a subtitution for a consultation with a rhinoplasty specialist. Nose surgery can cost upwards of $12,000. Due to the nature of this particular kind of surgery, it is definitely not cheap. However, the price of a nasal procedure is determined by several different factors. Some of these factors include severity of the damage, the location of the surgery, the doctor performing the procedure and the specifics of that particular case. Nose surgery cost is extremely dependant on the severity of the underlying problem. If there are many different issues that need to be worked on, then the price of the surgery will most likely increase. However, if the problem is very straightforward, the procedure should cost around $6,000 average, which is still pretty pricey for most people. The location of the surgery is probably one of the largest factors in determining cost. For example, in the United Kingdom, Great Britain, this procedure would cost approximately $20,000. On the other hand, there is a place in San Antonio, Texas, USA that offers nasal surgery for only $400. Though there may be some noticeable quality differences when it comes to the outcome of each procedure, this huge price gap is mainly due to the different locations of the surgery. Another thing that can influence nose surgery cost is the doctor who performs the procedure. Some doctors have been working as nose surgeons for years on end and have a vast array of knowledge and experience under their belts. These doctors will most likely charge quite a bit more for their services, seeing as they are usually able to perform at a higher level than the more unexperienced physicians. The surgeons who have only been in their field of work for a few years or less do not yet have the necessary experience or reputation to charge more than what the average customer is willing to pay. If they decide to overcharge patients, they risk a large loss of business and clientele. The final determining factor when it comes the price of nasal surgery is the specifics of an individual’s procedure. If a person wants a very complex and detailed rhinoplasty to correct their nose’s profile, shape, size and so on, chances are it will get to be quite expensive. However, if someone just wants a plain surgery to fix a broken nose, it will likely be on the lower end of the nose surgery cost ladder. If you have any questions about nose surgery contact your local doctor who will arrange for you to see a rhinoplasty surgeon. If you have made the decision to undergo rhinoplasty (nose job surgery) for cosmetic or medical reasons, it is imperative to first find an experienced surgeon who has a reputation for excellence in this field. Any doctor is licensed to perform any type of surgery. This is why it is important to take the effort in finding a surgeon who specializes in nose job surgery. This will help you to narrow down your choices of where to get plastic surgery in Sydney. A great way to get started in your search is to find a surgeon who is a fellow of the Royal Australasian College of Surgeons, the Australian Society of Plastic Surgeons, and other professional medical organizations with a focus on plastic surgery. The surgeon should have completed specialized training in plastic surgery, should maintain a strict code of ethics, perform procedures in accredited medical facilities, and continually evolve their techniques to stay in line with the latest innovations in plastic surgery procedures and patient safety. When searching for a doctor who performs Sydney plastic surgery, make sure that you opt for an experienced professional who not only specializes in rhinoplasty for cosmetic reasons but also for functional purposes. The surgeon should have plenty of experience performing procedures to change the shape and size of the nose, but also extensive experience in reconstructive procedures such as nasal septoplasty, revision rhinoplasty, sinus surgery, and for other medical purposes. Even if you are only going in for cosmetic reasons, choosing a doctor who is experienced in all fields of rhinoplasty will optimize your safety and will ensure the results you were hoping for. Just as the function of your nose will need to be maintained as changes are made for cosmetic reasons, if you are undergoing the surgery for medical reasons, the appearance of your nose is imperative. Choosing a reputable surgeon who is well versed in all aspects of rhinoplasty will improve the results achieved. Aside from knowing how their improved nose is going to look and function after a rhinoplasty surgery, patients are also eager to learn what to expect during the healing process. While the end results of the surgery can be quite dramatic and even life changing, complete recovery can be a long and gradual process. During the surgery, the bones and cartilage of the nose are transformed significantly, and the body needs ample time to heal and adapt completely. The good news is that majority of the discomfort associated with the surgery subsides rather quickly. 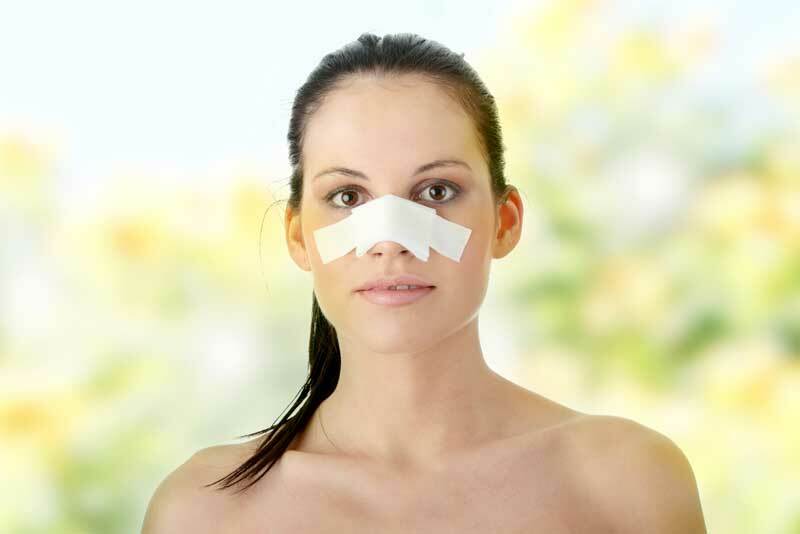 Lets take a closer look at the phases of rhinoplasty recovery. Like with any surgery, the first two to three days of recovery are the most challenging. This is when you are likely going to experience a few side effects of the healing process, such as headaches, bruising, nosebleeds, and mild discomfort. During this time, you may have nasal packaging, stitches, or a splint in place to assist with the shaping and healing of the nose. Your physician will likely prescribe mild pain medications, as well as detailed instructions for post op care. These guidelines will help you keep the area clean and healthy. During the first few days of recovery, it is especially important to rest, stay well hydrated, and enable your body to heal. A cold compress may be applied very carefully in order to reduce swelling. It may be necessary to have a friend or family member ready to help you with tasks around the house, as it is best for you to remain in bed with their head elevated as much as possible for the first few days. After approximately a week after the surgery, majority of the pain, discomfort, and other side effects of the recovery process will have subsided. The nose will likely still feel a bit puffy and swollen at this point, and the upper lip may retain a bit of stiffness. Your physician will schedule a follow-up appointment at this point to monitor the progress of your recovery. If the nose is healing as intended, any bandages or splints will likely be removed at this time. In order to maintain the shape of the nose, it is recommended that you do not place any weight on the nose, including wearing any eyewear that rests on top of the nose. If the one week follow-up appointment shows good progress, you will likely be ready to return to a more normalized routine. You can presume going to work, or school, as long as you are not required to partake in any strenuous physical activities. At the two week mark, you should feel almost completely recovered. There may still be some signs of swelling around the nose, but for the most part all discomfort will have subsided. At this point, it is even safe to partake in physical exercise again. The only activities that should be avoided are those that will put your nose in danger of being impacted, such as contact sports. Activities that could cause result in an impact to the nose should be avoided for at least two months after the surgery. Majority of the healing issues presented by rhinoplasty surgery are mild, or even largely imperceptible, after the first two weeks of recovery. Most of the recovery process involves practicing good post-op care, and keeping your nose protected as it heals. Slight swelling can persist for an extended period of time, and the definitive results of your surgery may not be completely apparent until up to one year after the procedure. The bones within the nose are among the weakest in the entire human body, and therefore much more susceptible to fractures and breaks. A broken nose can be the result of a sporting injury, a physical altercation, or any impact or fall. There are a few clear symptoms that will indicate a broken nose, such as swelling, bruising, black eyes, nosebleed, difficulty breathing, or a clearly deformed nose. Determining the right course of treatment for a broke nose can be fairly difficult, and largely depends upon the severity of the break and the personal preferences of the individual. There are a few at home remedies that can be applied to a broken nose immediately following the break. The primary cause of pain in the nose is going to be from the swelling around the break. Placing a cold compress gently over the nose for short periods of time can alleviate the swelling. The compress should not be left on the nose continuously, and ice should not be placed directly onto the skin. To further alleviate inflammation and pain, over the counter medications can be taken as directed, such as Tylenol, or Advil. To reduce the blood flow to the head, the head should remain elevated. When in bed, alleviate the head in a way that does not cause the neck to remain at a bent angle. In order to improve the ability to breath the through nasal passages, decongestants can be used as directed. If breathing remains difficult after using the decongestant for two days, it is essential to seek consultation with a physician. It is always smart to have a broken nose examined by a doctor within the first few days of the break. The physician can determine if the break is going to affect the ability to breath, cause internal bleeding, disturb nearby facial bone structures, or have any other serious health ramifications. In the event that the broken nose is treated using home remedies only, but the symptoms of the break continue after three days, a visit to the doctor is strongly recommended. If the break is addressed soon enough, the physician may even be able to set the bones in order to correct, or at least reduce, any crooked appearance. There are two primary reasons one would consider rhinoplasty in order to correct the affects of a broken nose: to correct breathing problems or to improve the cosmetic appearance of the nose. Even if a doctor is able to set the bones immediately after the break, there is a chance that once the nose has completely healed, the nasal passages may be obstructed, and the nose may not be as straight or smooth as it was previous to the break. To receive the best results possible, it is wise to consult with a surgeon soon after the break. In order to be a candidate for a closed nasal reduction, the procedure will need to be completed after the swelling from the injury has subsided, but before the bones have had a chance to set. Once the bones have set, an open nasal reduction will be necessary, which involves re-breaking the nasal bones and resetting them into a more favorable position. The decision of whether or not to choose rhinoplasty to correct a broken nose is largely left to personal preference. Each individual patient will receive a different level of results and benefits depending upon the challenges presented by the unique circumstances of the break. Regardless of whether the cosmetic appearance of the nose is of high importance, all individuals suffering from broken noses should seek the medical attention necessary to ensure they remain healthy. The decision to receive any surgical procedure always comprises a certain level of risk, and rhinoplasty is no different. When choosing whether or not to have the surgery completed, one must weigh the potential risks with the potential benefits that can be achieved. In the end, choosing rhinoplasty is a very personal and delicate decision that should be well researched. Any qualified and experienced surgeon will be happy and willing to discuss all of the risks, and address any concerns, prior to the procedure. There are certain risks that are present any time an involved surgical procedure is administered. During the rhinoplasty procedure, anesthesia is utilized. A qualified anesthesiologist should administer the anesthesia, but there are always safety concerns involved with this practice. If the procedure lasts for a lengthy period of time, there are risks of cardiac and pulmonary complications. These risks are present during all longer surgical procedures. These complications occur when an increased number of blood clots begin to develop within the venous system. These complications occur relatively rarely within rhinoplasty patients. As with any surgery, it is important to practice good post-op care in order to avoid infection of the wound as it heals. Majority of the risks and concerns surrounding rhinoplasty are related to the cosmetic outcome of the surgery. There is a chance that the wound may not heal as intended, leaving visual imperfections. These imperfections can include the appearance of scarring, skin discoloration, nose asymmetry, or the appearance of curves or bumps. The end functionality of the nose may not reach the desired outcome if the wound does not heal as desired. After the surgery, the nasal passages may not be as open as necessary, restricting the amount of airflow. Other possible side effects of rhinoplasty include: a change in skin sensitivity around the nose, swelling, bruising, and discomfort. These symptoms normally dissipate over time as the area heals. If significant problems do occur, cosmetic or otherwise, they can typically be corrected with the help of follow-up treatments or revisional surgeries. The most effective way to reduce these risks is to listen carefully to the instructions set forth by your physician. Any pre-op and post-op directions should be followed as closely as possible in order to achieve a safe and healthy recovery. Your physician should provide very clear at-home care guidelines that will help you keep the wound clear of infections and support the healing process. The post surgery instructions that you will receive will likely encourage you to rest as much as possible during the first few weeks after the surgery. It is essential not to exert yourself, or participate in any strenuous physical activities soon after the surgery. Remember, even when the discomfort of the surgery has subsided, the nose is still setting and healing into its new permanent shape. Do not hesitate to communicate any concerns with your doctor before and after the procedure. By asking questions, and being vocal about your needs, you may even determine that maybe rhinoplasty is not the right choice for you. If you do decide that the surgery would be beneficial for your nose, understand that the procedure is not an exact science. Every nose is unique and will respond to the process in its own way. This means that it is nearly impossible to determine exactly what the results will be, and that a second minor surgery may be necessary to achieve your goals. With the right knowledge, patience, and care, rhinoplasty can be a safe and very effective procedure.